At ICS 2010, Dziembowski, Pietrzak and Wichs introduced the notion of non-malleable codes, a weaker form of error-correcting codes guaranteeing that the decoding of a tampered codeword either corresponds to the original message or to an unrelated value. 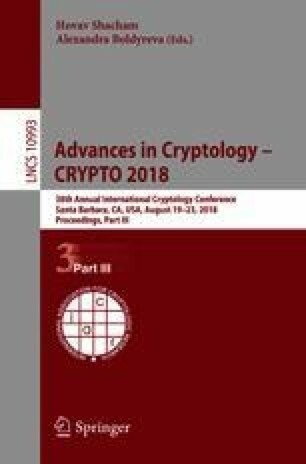 The last few years established non-malleable codes as one of the recently invented cryptographic primitives with the highest impact and potential, with very challenging open problems and applications. In this work, we focus on so-called continuously non-malleable codes in the split-state model, as proposed by Faust et al. (TCC 2014), where a codeword is made of two shares and an adaptive adversary makes a polynomial number of attempts in order to tamper the target codeword, where each attempt is allowed to modify the two shares independently (yet arbitrarily). Achieving continuous non-malleability in the split-state model has been so far very hard. Indeed, the only known constructions require strong setup assumptions (i.e., the existence of a common reference string) and strong complexity-theoretic assumptions (i.e., the existence of non-interactive zero-knowledge proofs and collision-resistant hash functions). As our main result, we construct a continuously non-malleable code in the split-state model without setup assumptions, requiring only one-to-one one-way functions (i.e., essentially optimal computational assumptions). Our result introduces several new ideas that make progress towards understanding continuous non-malleability, and shows interesting connections with protocol-design and proof-approach techniques used in other contexts (e.g., look-ahead simulation in zero-knowledge proofs, non-malleable commitments, and leakage resilience). Research supported in part by “GNCS - INdAM”, FARB 300392FRB15VISCO, NSF grant 1619348, DARPA SafeWare subcontract to Galois Inc., DARPA SPAWAR contract N66001-15-1C-4065, US-Israel BSF grant 2012366, OKAWA Foundation Research Award, IBM Faculty Research Award, Xerox Faculty Research Award, B. John Garrick Foundation Award, Teradata Research Award, and Lockheed-Martin Corporation Research Award. The views expressed are those of the authors and do not reflect position of the Department of Defense or the U.S. Government. Work partially done while the second and fourth authors were visiting UCLA.